Starting early, Muslims are already ‘celebrating’ Nakba Day. 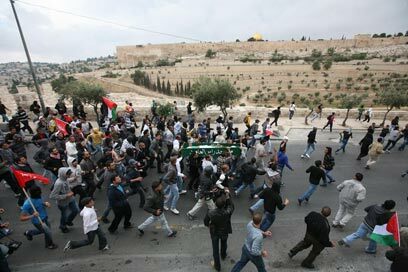 East Jerusalem tensions near boiling point. Hundreds attended the Saturday funeral of 17-year-old Milad Ayache, who suffered a fatal gunshot wound to the abdomen during a ‘Nakba Day’ riot in the east Jerusalem neighborhood of Silwan on Friday. Loving peace is so complicated these days. Don’t hesitate for even a nanosecond. This entry was posted on Saturday, May 14th, 2011 at 10:32 and is filed under Main Postings. You can follow any responses to this entry through the RSS 2.0 feed. You can leave a response, or trackback from your own site.